At 8.41 lbs, the Paslode framing nailer falls into that middle ground of what you’d expect a Pro pneumatic nailer to weigh. We’d prefer that it weighed a little less, but it could be a whole lot worse. It’s not “fat”…just big-boned. While the body of the tool feels relatively compact for a pneumatic nailer, the 4.875″ width of the head seems a bit more robust than we’d prefer. This could keep it from performing comfortably in tighter corners. Beyond those critiques, the tool has nice rubber overmolding and good balance. Even after firing hundreds of nails, the Paslode framing nailer feels comfortable in the hand. Here’s where this framing nailer really gets its act together. After the annoyance of the ever-present hex wrench and the wide head, the F-350S comes into its own in the performance category. We fired 3-1/2″ nails…lots of them…into glued-up stacks of OSB. Then we fired some more. We set our compressor to the recommended 80 psi, and fired off ten nails. All ten nails sunk fully, with none standing proud. If you ever need to fire into a denser material, the F-350S shouldn’t present too many issues and it will take more air. Paslode has its recoil issues pretty well figured out. In fact, it almost feels nonexistent. Both Paslode models we’ve tested have truly set the bar for how we gauged recoil with every other tested tool. The Paslode F-350S framing nailer excels in toenailing. Its tip design works really well for biting into studs at awkward angles without slipping. It toenails both quickly and consistently. Part of this, we believe, is due in part to the aforementioned recoil control. The firing accuracy on the F-350S is on-point as well. The tip design really allows you to see what you’re doing. Accuracy probably isn’t the end-all, be-all in framing nailing, but it never hurts to hit what you’re aiming for. 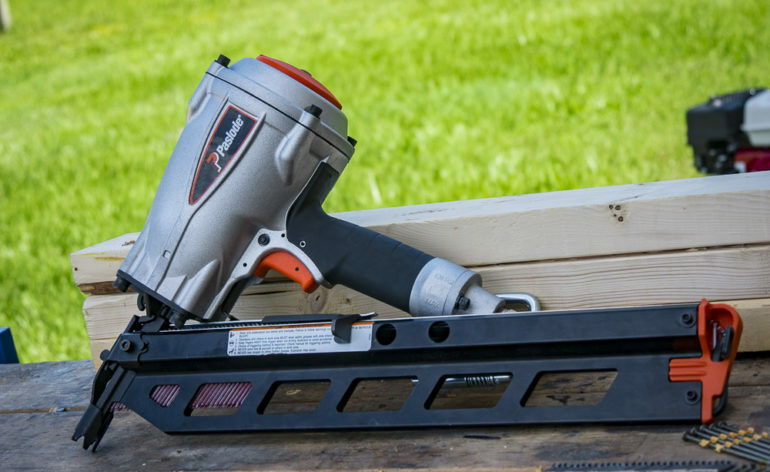 The F-350S Paslode framing nailer retails for $249, which is kind of expensive. That price reflects the quality of the tool, and there’s something about the Paslode that makes us feel like it’s simply worth the money. The F-350S comes with a 5-year limited warranty on the housing and cap parts, a 1-year limited warranty on magazine parts, and a 90-day limited warranty on wear parts (like the firing pin). If the warranty is important to you, there are companies that offer a bit more in this department. It really is too bad that the Paslode F-350S can’t seem to ditch the hex wrench. The other model we tested doesn’t suffer the same issues. Since this Paslode comes at a premium price, we wondered why they couldn’t have gone toolless for the exhaust, depth, and firing mode adjustments. Those few things hinder this model’s overall appeal. From a performance standpoint, the price for the F-350S can be justified. It has power in spades, and it has a great tip design that allows for stable, accurate nailing. Since, in our opinion, performance outweighs the underwhelming feature set, it’s not difficult to see why we can still safely recommend this nailer to Pros.